The best $5 I’ve ever spent. Have you ever used up 7+ toothpicks to test if your baked good is finished baking? I have and I never have to waste another toothpick to test a cake, muffin, or bread. Plus, the diameter of the metal tester is so small that you can hardly even see where it poked the baked good. No evidence. My opinions about this product are my own and I received no monetary compensation to review this product. I love this- I bought myself one a few years ago and it was a great purchase! 😀 You should. An awesome little tool. yep. i totally use a bunch of toothpicks…i need this. 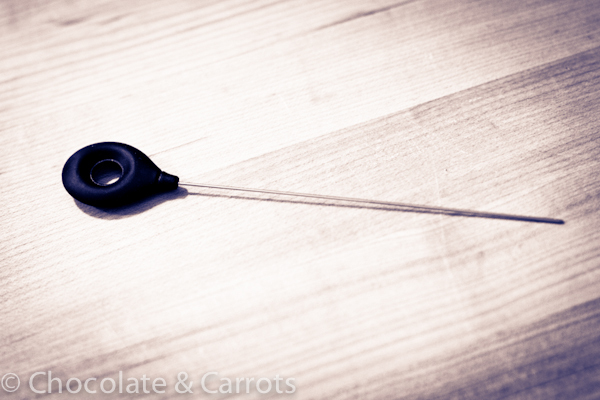 I use a thin double pointed knitting needle as my cake tester but love the idea of your super cool one. why can’t you use a toothpick twice?